I RECENTLY saw Basingstoke Town play at Hitchin. I was as a little surprised to hear they had turned pro. Basingstoke is a sizeable town of more than 100,000 people, which makes it comparable to a handful of Football League locations. You would assume there’s upside potential. In April this year, the club announced that it would be going “full-time” with effect from 2016-17 with the aim of recruiting the best young players released by Football League clubs in the south of England. Quite what this really means is anyone’s guess, but given that over the past decade, Basingstoke have averaged gates of 460, it does make you wonder how such a commitment can be sustained at step three of the non-league pyramid. At the time of the announcement, the club’s manager, Terry Brown, always a highly respected football man from his time at Hayes, among other clubs, said that the move was all about making Basingstoke more financially viable and removing the need for the club to rely on individuals pouring money into the coffers. Sustainable growth is certainly an ambition that every non-league club should aim for, but isn’t this a step too far? It depends how you define it, but enough clubs find it tough enough to maintain semi-professionalism, let along the real thing. The timing was also something of an eyebrow-raiser. Basingstoke were relegated in 2015-16 after being in the National League South since 2004-05. Terry Brown was appointed in March with the remit to stave off the drop, something he had never suffered in his long career. Unfortunately, he was unable to prevent Basingstoke falling out of National South, just one year after they had finished in third place. Although Brown’s team looked fresh-faced and energetic, the results suggest they may be in for a transitionary season – they lost at Hitchin and before yesterday’s games, they had won just twice. I wish them well as I have always enjoyed visiting the Camrose. Basingtoke’s bold decision reminded me of a conversation I had in the Enfield boardroom after they had come down from the Conference to the Isthmian Premier. “As far as we are concerned, the Conference is semi-professional football and the Isthmian part-time,” I was told. It was a strange statement to make, especially given the way things went for that one-time big club, but the Enfield official was making a valid differentiation. And since that night, the gap between the top level and the steps below has probably widened significantly. In 1993-94, there were probably no “full-time” teams in the Conference, but today, with so many former Football League clubs in residence, it is a very different ball game. On a general point, should teams outside of the Conference try to keep up with the Lincolns, Tranmeres and Wrexhams of this world? Common sense would argue that the revenue streams and public appetite for football at step three just doesn’t warrant such a move. In 2015-16 average attendances at step three, for example, were at their lowest level in more than a decade and some 15% down over the past five years. They are marginally up this year. How can clubs that attract fewer than 400 people provide any sort of competitive wage from their natural, organically-grown income? There is an argument that football outside the Football League shouldn’t be full-time at all. That’s a little hard to insist upon when teams get relegated from full-time football to a world that might seem like “nomansland” to some. There will always be clubs aspiring for a crack at the Football League. However, when you get to step two and three, the logic and prospect of sustainability of professionalism is in danger of being pure folly. Ambition is one thing, but living beyond your means is a disaster. 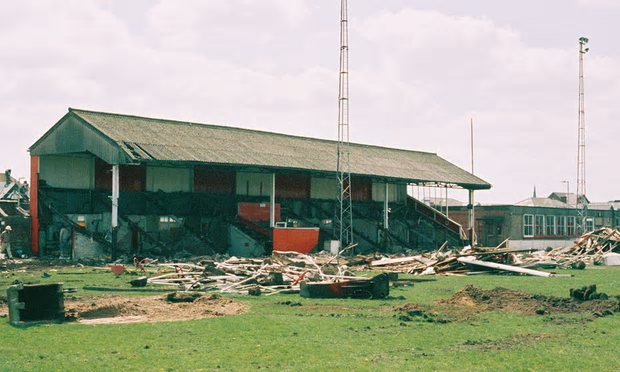 Non-league football is littered with the wreckage of clubs that have flown too close to the sun only to discover their wings are made of wax. The tale of Icarus really is worth reading. First published in The Non-League Paper, Sunday September 18, 2016. How about a credit for the photographer of the excellent pic you gave used? Yes indeed, I saw the tweet, Mike. Ommission on my part – I usually use my own photos wherever I can. Hi Neil, your more than welcome to visit the Ark Stadium (not Camrose for 1 season anyway), anytime, but your article never mentioned anything about the new young team, the game or anything like that. I do not disagree with most of your statement, but it was about the state of football, not what Basingstoke are trying to do. You should really do an article about the owner Rafi Razzak, who does not really care for football, who wants out, but seems on the surface not to be trying to find a new owner to take over. Hi, the article you commented on was from the NLP. I deliberately didn’t talk about the game (I would refer you too one I did earlier that does talk about the game v Hitchin). It was a general piece on the idea of full-time and step 3, which I find ridiculous. I did mention that the team was young and energetic, though, didn’t I? I wish Basingstoke well, but I fear it will be, at best, an abandoned project. Lot of time for Terry Brown – I interviewed him when he was at Hayes.